This "kettle" of rising Broad-winged Hawks was right over our house yesterday morning. 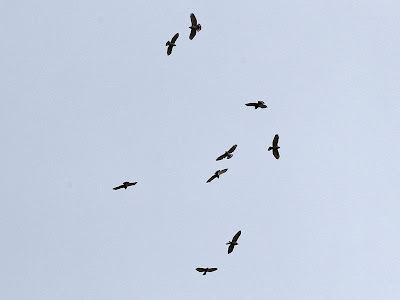 other NH sites also reported big raptor numbers, (for spring). 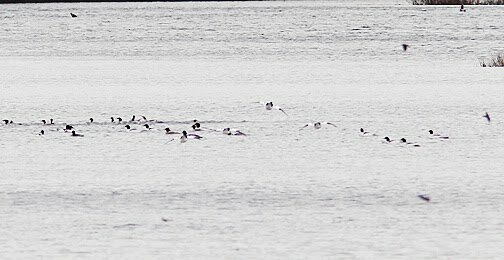 Low cloud ceiling with clearing in the morning, produced low thermals and the Broadwings moved. 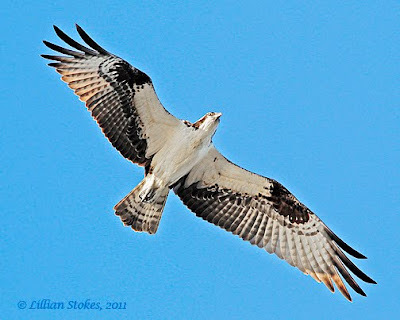 This was our best ever spring hawk watching day here in NH!!! Awesome! 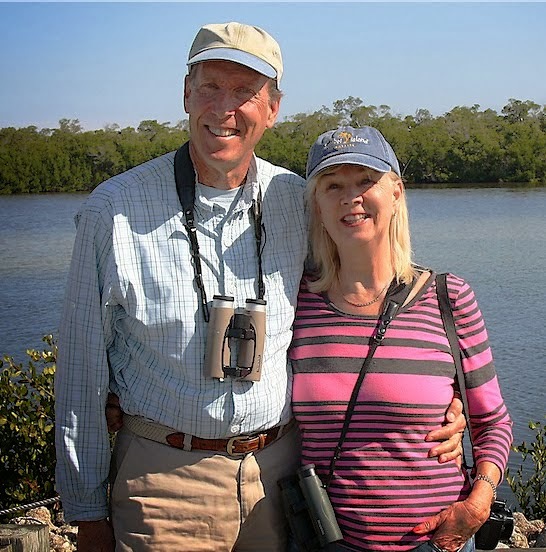 Whether you are a beginning, intermediate or advanced bird watcher learn how to better identify birds from the experts, Don and Lillian Stokes, authors of the new, national best-selling bird guide The Stokes Field Guide to The Birds of North America. Learn to Identify those spring migrant birds like a pro with "quantitative shape" the new tool for bird identification pioneered in their new guide. 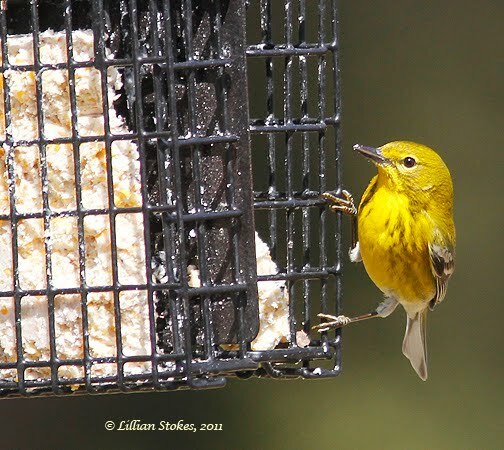 Join this lively presentation where the Stokes will share with you what was involved in producing their 6-years-in -the-making new field guide, help you fast forward your birding skills, and show you beautiful photos, taken by Lillian, of Massachusetts' birds. There will be a book signing before and after their talk. Bring your Stokes guide along for a signature or become the proud owner of one. 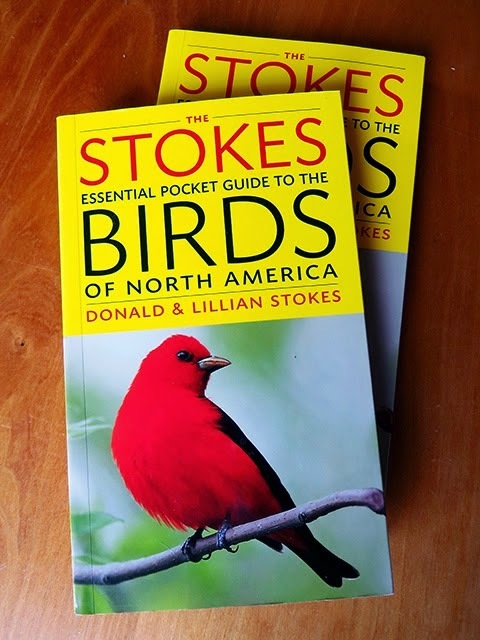 The Stokes Field Guide to the Birds of North America is the most comprehensive national field guide ever produced and features over 3,400 stunning photos. It also includes a promotional CD of 600 sounds of 150 common birds, recorded by Lang Elliott and Kevin Colver, which will help you identify by ear the spring birds. 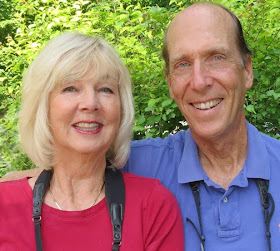 Don and Lillian Stokes have been prominent bird authors and educators for over 30 years. 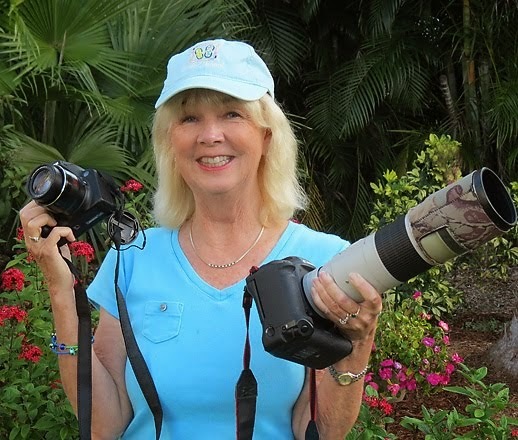 They created, hosted and produced the first national PBS television bird watching shows and more than 40 million viewers tuned in to their “Stokes Birds at Home” TV series. They have written over 32 bird and nature books, which have sold over 4.5 million copies. 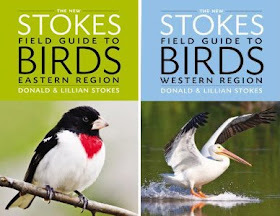 Their books have included such bestsellers as Stokes Field Guide to Birds Eastern and Western Regions, Stokes Beginner's Guide to Birds Eastern and Western regions, Stokes Field Guide To Warblers, Stokes Beginner’s Guide To Shorebirds. 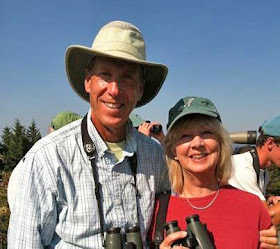 Don and Lillian received the Partners in Flight National Conservation Award in 2005. 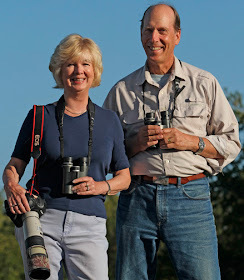 They have been writers and columnists in all the most popular birding magazines. 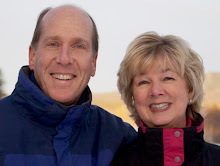 Residents of Massachusetts for over 20 years, they now live at Bobolink Farm, their 48 acre southern NH property, to which they have attracted over 190 bird species. The meeting will start at 7:00 PM. The authors will be available for book signing starting at 6:30 PM and at the end of the meeting. The talk will be preceded by our our annual meeting including election of officers. Our meetings are held at the Visitor Center at the Assabet River National Wildlife Refuge, 680 Hudson Road in Sudbury, MA 978-443-4661 (Google Map). We are seeing a steady flow of Ospreys over our "pond" (actually a dammed up section of river) as they make their way north on migration. We have also seen other raptors moving through here on the strong winds that have been occurring. It's hard to get any work done! We just want to go out an sit all day watching the sky. Ospreys are just awesome raptors with their bold underwing pattern of black primary coverts and black secondary feathers. Makes them easier to identify. Not the big raptor numbers we see here in SW NH in fall, but what a great diversity of raptor species! Look up, spring raptor migration is going on in many parts of the country right now. Let us know if you see any raptors. This morning we saw several Yellow-rumped Warblers coming through on migration, the first of the year (FOY) we have seen. Our excitement begins to mount because this is just the start of the warbler bonanza to come. If you're going to learn warblers, start by learning Yellow-rumped Warbler, one of the most ubiquitious and abundant warblers. 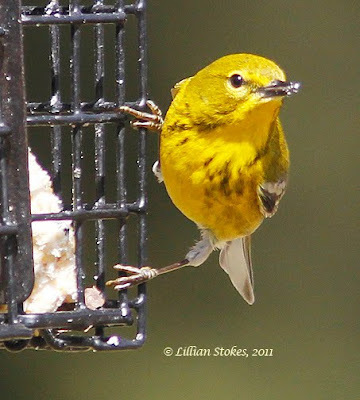 Learning warblers in spring is easier because they are in their colorful breeding plumage. The males in particular are easy to ID because they have bold colors and patterns, females have the same patterns in more subtle colors . 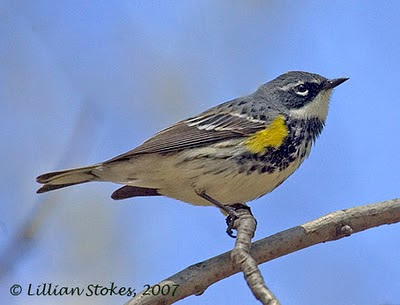 The male yellow-rump has bold yellow side patches, a yellow rump and crown patch, white throat and heavy black streaking on breast. There are now 2 subspecies of yellow rumps, which were formerly considered one species. Above is the subspecies ("Myrtle Warbler", Dendroica coronata coronata) which we see here in NH. 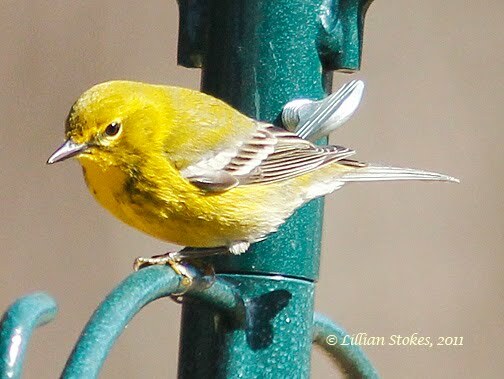 If you live in much of the west you will see the subspecies, "Audubon's Warbler," Dendroica coronata auduboni, which has a yellow throat. Our yellow rumps were singing their weak trill song. If you really want to get ready to ID spring warblers see our new The Stokes Field Guide to the Birds of North America, which has the most complete warbler section of any field guide, which is getting rave reviews. AND it comes with a free downloadable CD of common bird songs (over 600 sounds by Lang Elliott and Kevin Colver). Listen to the sound of the Yellow-rumped Warbler on track 108 and tune-up for spring. 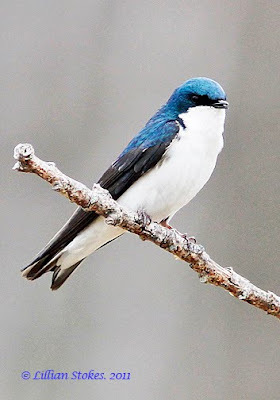 Newly arrived Tree Swallow, we saw 130 + Tree Swallows here today. Put up bird houses with a 1 1/2 inch diameter opening, Tree Swallows will nest there and housing is in short supply for them. Today we saw 130 + Tree Swallows all flying over the pond and our fields. Many were competing for our bird houses. We stood in the middle of a swarm of swallows, they were swooping and feeding all around us, some flying so low we have a view of their backs. It was pure magic. The hummingbirds are coming, will you be ready? Ruby-throated Hummingbirds have been flooding into the Gulf Coast on their return migration since Feb. They have already been spotted as far north as CT, southern MA, PA, OH, IL and even southern MI. 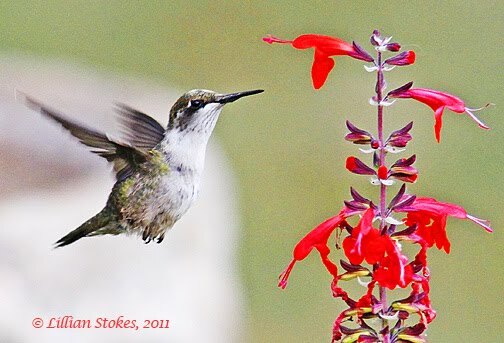 Here's a Ruby-throated Hummingbird migration map 2011 where you can report your sightings and see what others have reported. Get your hummingbird feeders up if you live in those areas and south, and consider putting up feeders soon if you live north of there. 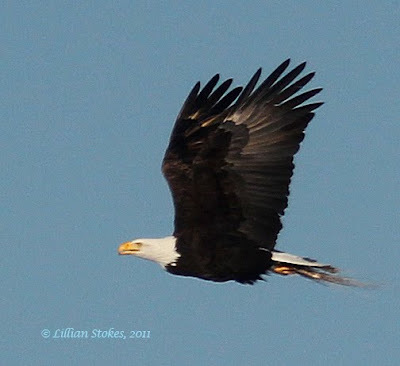 This morning we had 2 adult Bald Eagles collecting grassy nesting material in our field at the edge of our pond. One of them was on the ground at the edge of the pond and grabbed a bunch of grasses and weeds and flew off. The other sat in a tree above for half an hour, then went down into the field grabbed some grass and flew off. They were not building a nest on the pond, instead they flew away to the northwest. We saw an adult eagle also collect nesting material on 4/2, and I got a this photo of that bird then. I has a clump of grasses in its talon and there might be a band on the left talon. Bald Eagles build nests of sticks and line them with sod, grasses, seaweed and other materials. Eagles continue to bring material to their nest throughout the incubation and nestling phases. Both male and female build the nest. There is a pair of Bald Eagles nesting on a lake about 6 1/2 miles northwest from here. We wonder if these are the same eagles, or mystery eagles who have a nest somewhere else. More detective work is needed. Wow, this morning a newly arrived beautiful, male Pine Warbler was eating suet at our bird feeder. It made our day. Smart bird, as there are fewer insects and other food available to him right now. Later in the morning he was singing his trilled song from, you guessed it, our pine tree. Yup, Pine Warblers nest in pine trees here in southwest NH. Also goes to show how suet attracts many species of birds beyond the usual feeder crowd. We have seen Pine Warblers eat suet, hulled sunflower seed and hom made suet meal. This is the first warbler to appear here so far, can't wait to see more. 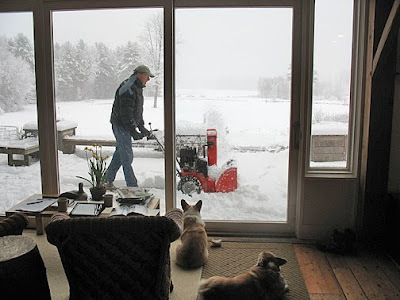 It's snowing here in southwest NH! Here's a photo I just took of Don snow blowing the deck, while the Corgis, Abby and Phoebe (lying down) watch. It's wet, heavy snow and we have about 5 plus inches with more predicted. We will spend lots of time cleaning off the bird feeders today and making sure they are full. Is this an April Fool's Day joke from mother nature?